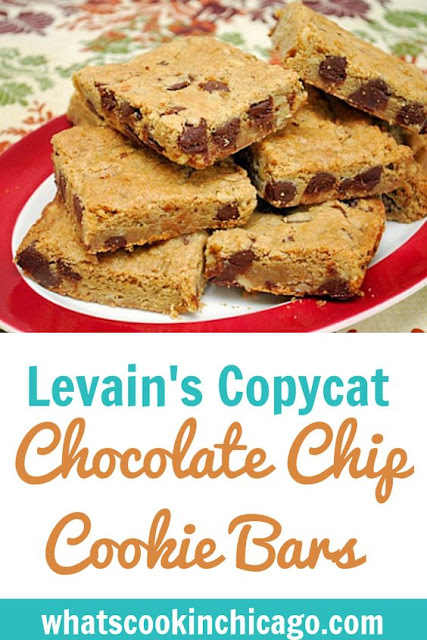 Article first published as Levain's Copycat Chocolate Chip Cookie Bars on Blogcritics. One of my favorite celebrity chefs is Bobby Flay. I respect his straightforward attitude towards food and enjoy watching him on his show, Bobby Flay's Throwdown. In this show, he challenges folks known for a specialized food or dish by creating his own version. The dishes are judged by a blind panel and in some cases, Bobby wins. One of the most recent episodes I watched involved a chocolate chip cookie throwdown against New York City's famed Levain Bakery. Ever since watching it, I've been craving chocolate chip cookies. After some searching I came across a copycat recipe for Levain's popular cookie. I took the recipe and adapted it by making these Levain's Copycat Chocolate Chip Cookie Bars. 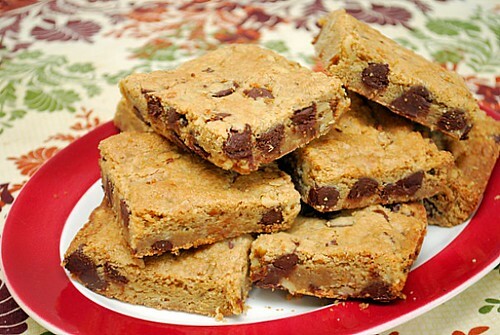 If you're a chocolate chip cookie fan, these will knock your socks off! I need to preface this recipe by noting you won't be able to make this today. Why? Because to really get the butterscotch and caramel notes that most people love about chocolate chip cookies, you'll need to wait about 2 days. Yes, that's 48 hours folks. But I promise you the wait is worth it! During that time, the cookie dough does some magical things. The flavors really meld and makes the dough much tastier and fragrant too. Once you've tested your patience, you'll be able to place it in a baking dish and devour them once fresh out of the oven. I can't even explain how good it is! Add flour, salt, baking soda, baking powder and mix until just combined. Gently fold in chocolate chips and nuts. Transfer dough to clean work surface and gently mix dough by hand to ensure even distribution of ingredients. Place the dough in a covered storage container and chill for no more than 2 days/48 hours. Once ready to bake, preheat oven to 375 degrees. Prepare a 9x13 inch baking dish by lightly greasing. Place dough into the prepared baking dish and spread out evenly. Bake in the preheated oven 25-30 minutes depending on how gooey you like the interior, until very lightly browned, and be careful not to over bake. The edges will look done but the middle may still be a bit soft. Remove from oven and let the pan cool on rack. Once cooled, cut into large squares and store what you don’t immediately eat in an airtight container. can't wait to try these! I am the 1 person who can't make cc cookies - they are always flat. Bars, bars I can do! I have heard that letting the cookie dough sit for a couple of days makes the flavor better, but it's just so darn hard when you get that craving! I have these in the fridge now. The sugar content is probably closer to the recipe you adapted it from since I didn't quite have a cup of dark brown sugar left so I substituted light brown. I also used semisweet chocolate chips. I can't wait to bake them tomorrow. Next time I may try adding some vanilla.